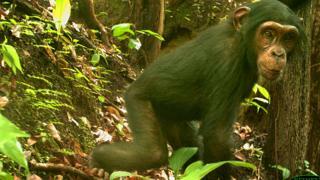 The world's rarest chimpanzee has been captured on camera in the remote forests of Nigeria. The Nigeria-Cameroon chimp was seen at various locations within Gashaka Gumti National Park, raising hopes for its future survival. Conservationists also recorded the first sighting in the country of a giant pangolin. The park is regarded as a national treasure, but its wildlife is under threat from pressures such as poaching. Researchers from Chester Zoo, working with the Nigeria National Park Service, surveyed over 1,000 square kilometres of the national park. Known for its mountain rainforests, savannah woodlands and rolling grasslands, it is home to some of West Africa's most endangered animals. The cameras spotted some animals that have never been recorded before in the area and others, like chimps, which are rarely seen. Stuart Nixon, the Africa Field Programme Co-ordinator at Chester Zoo, said confirmation of the locations of chimps was an important discovery. "Gashaka's been regarded for many years as having the biggest population of this Nigeria-Cameroon chimp, which is the rarest chimp subspecies," he said. "We consider it the most important population - that's really why we need to count it and see what the status of the chimp is right now - that will ultimately affect what we know about this subspecies elsewhere." The chimp is endangered across its range in Cameroon and Nigeria. Its total population is down to fewer than 9,000 individuals, of which about 1,000 are thought to live within the borders of the national park. The ape faces many threats, from illegal poaching for bushmeat and traditional medicines to loss of habitat. Wildlife experts are exploring new areas of the park to get a better idea of numbers, as there have been no population surveys for 20 years. The cameras captured more than 50,000 images of the park's wildlife between 2015 and the end of 2017. 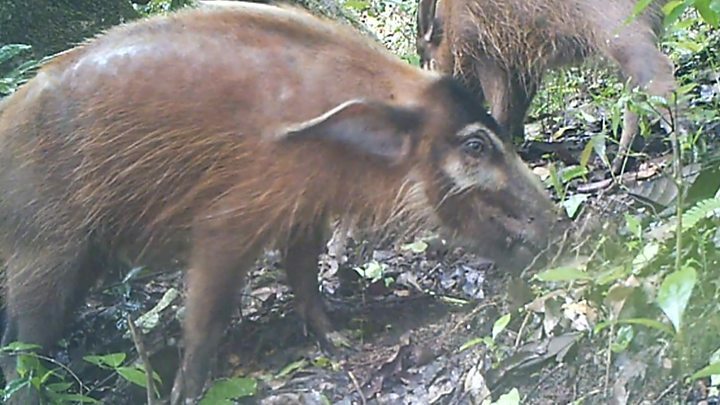 "It's an incredible tool to use these camera traps and to reveal that this park - which is a forgotten wilderness, really, for Nigeria - still has a really important reservoir of important species for Nigeria and Africa in general," said Stuart Nixon. The researchers were surprised to spot a giant pangolin, which is one of the rarest and least known of the six species. The scaled mammals are poached for their scales, which are used in traditional medicine, and their meat. "No-one's seen a giant pangolin - no-one even knew that they were there," said Stuart Nixon. "It's the first record for Nigeria as well - that highlights how rare, how elusive and how difficult they are to find and study." Camera traps also found the first photographic evidence of leopards, which may make up one of the most significant populations in West Africa. The African golden cat was also seen on images. "It's likely that it's the only significant population of the golden cat left in Nigeria," said Stuart Nixon. "Very elusive, very little known, there's not been many studies on them at all." Chester Zoo has been supporting Gashaka Gumti National Park for more than 20 years, intensifying their efforts recently to address growing threats to the park's wildlife. The wildlife within the park is officially protected but some animals are at risk of poaching. Chester Zoo is funding patrols for the rangers and providing training in wildlife monitoring and protection. Yohanna Saidu of the Nigerian Park service and chief warden of Gashaka Gumti National Park said there were few places in Africa that can rival its spectacular beauty. "But it survives barely known by the international community and under increasing threat," he said. "This work is helping us learn more about the secrets of one of our last wilderness areas and we must continue to work together to ensure its survival for future generations. "If all this beauty were lost it would be a terrible tragedy for all."